Well, we finally made time to get to the boatyard this past Sunday morning. 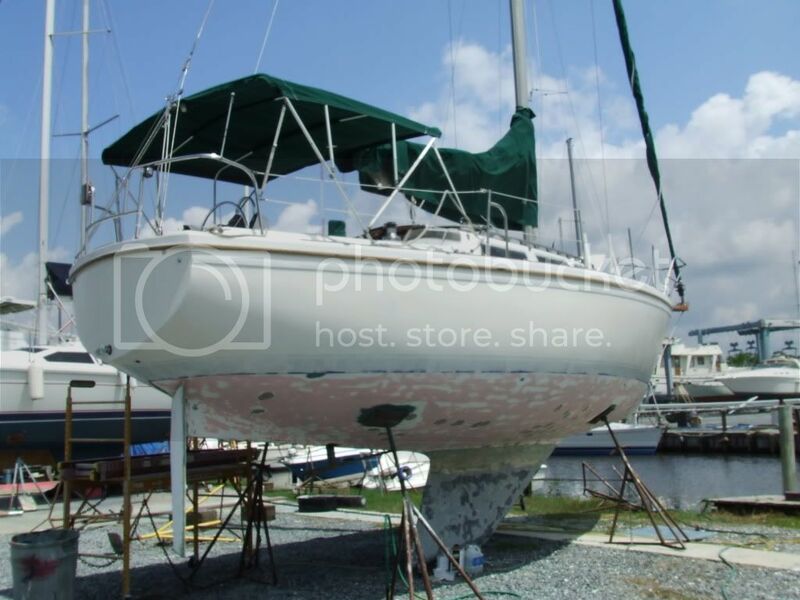 The picture above is actually how our sailboat looked right before being painted, after being sanded and primed. At first I thought this was after the first coat of paint, so sorry for the mix up. If you look close, the hull isn't near as glossy as the pictures below. We ran errands all day Saturday, so we got up early and to the boatyard by 7:00 am on Sunday. When we arrived Sunday morning Ken lightly sanded the sailboat hull (again) and then I washed the hull (again)! We ran errands while our sailboat dried for about an hour and then the painting finally began. Ken started rolling the Interlux Perfection 2-part paint (Oyster White) and Ted followed with a paint brush. This technique is called rolling and tipping. *See why we chose Interlux over Awl-Grip here. The first coat of paint only took about an hour and a half to do. However, it is recommended that drying time between coats is 4-6 hours. Therefore, another coat could not be applied to late afternoon. Sounded like a good reason to go sailing on Ted's boat! All of us had an extremely busy and stressful week, so we really needed the break. It was so relaxing! Ken and Ted hope to apply the second (and final) coat no later than this weekend. Time keeps ticking by. You can really see the difference between before and after the hull paint. The sailboat hull is so much glossier with the Interlux Perfection on it. That night Ken and I looked at our sailboat to see how it was looking after having a chance to "lay down". I thought the boat looked great, but Ken was not happy to still be able to see brush strokes. Ken is now considering spraying the second coat. 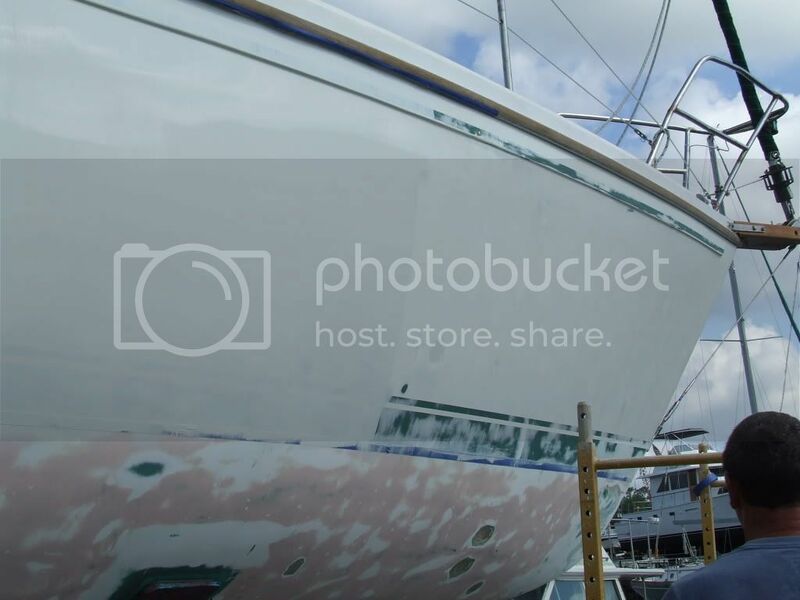 He says he's not worried about getting the sailboat hull perfect, but he does take a lot of pride in his work and he's just not happy with it. We shall see what Ken decides to do from here - roll or spray. Hasta luego ... until then. Mid-Life Cruising! I'm guessing he's going to spray. You have that first, most important coat down, so why not. Looking good. I know you are getting excited about getting her back in the water and do some sailing. I know I would be. I'll be interested in hearing Ken's experience with spray finishing. Does he have previous experience with spraying two-part paints? What type of equipment did he use? What would he recommend to others considering this approach? From the photos, the roll and tip job looks great. Wow the hull really does like nice! I understand Ken's frustration. I am sure it will look better with the second coat, whether you spray or roll! Thanks for the compliments. We can't wait to see the finished product too (and get Nirvana back in the water). Ken's a contractor so he's sprayed paint quite often, but not a 2-part paint. We'll keep you posted. Honestly! I'm beginning to think owning a house is easier than owning a boat. We planned on moving aboard next week but guess what?! 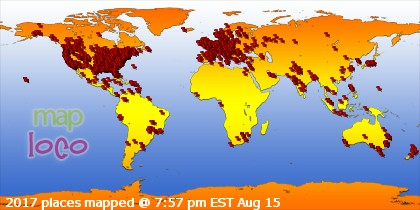 We have blisters (sound familiar?) and you wouldn't believe the quote we received to fix them!! Hans got all fired up and suggested we go down and take care of them ourselves. NO THANK YOU!!!! It won't be long now until you have her back in the water. Congrats on doing such a great job so far! As a painter I'm sure you know your craft, but I will share my experience (I painted the same boat twice with perfection - I owned the boat for 17 years and it was bad when I bought it, and I painted it to sell it). I used a mohair roller and didn't tip. I played with the solvent and found that with just enough, it layed down better and with fewer marks than if I tipped, even with the finest brush. But I might have sprayed if the marina would have allowed... but they did not for good reasons. Get ANY overspray on someones 50-foot pride-and-joy and you will be hating life. 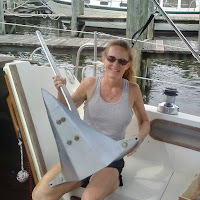 Some of these folks are pretty obsesive compulsive with reguard to their boats and fo one microscopic spot they will want the hatches replaced, the boat painted , and damages too. I would think twice about spraying, given that there are other boats nearby. Additionally, check the yard rules. I bet the second coat looks better anyway. Thanks Mike! We can't wait to get her back in the water. Even more, we wish we were leaving as soon as you are for the cruising life. Laura - We had 81 blisters and the boat yard charges $40 a blister. Ouch! Good luck and we look forward to your new sailing blog. Drew, thanks for the advice. We also used a 9" mohair roller. I will tell Ken about your experience. If we do spray, it is allowed by the boatyard and fortunately there are no boats nearby as of now. We had to order more paint so we'll be working on the blisters this weekend. Hey, if there are no boats around now, go for it. I just know how some folks can get! Me, I wear dock rash as a badge of experiences. I probably wouldn't notice the over-spray! My first boat was all epoxy and this one came with factory barrier coat, so blisters are a pain I have yet to know; good luck and take your time. Sounds like you want to get them all in one go. Did I miss the breakdown on the haul out costs? Love the blog and keep following your dreams!